Well if you’re a Lakers fan, in a basketball level, my heart goes out to you. This season the Lakers have broken records. However most of these records are not good records. This is historically the worst season ever. Pouring salt in the wounds, the Clippers gave them their worst beating ever en route to possibly being NBA champs this year (I think I threw up in my mouth a little). Easy answer. Blame D’antoni. 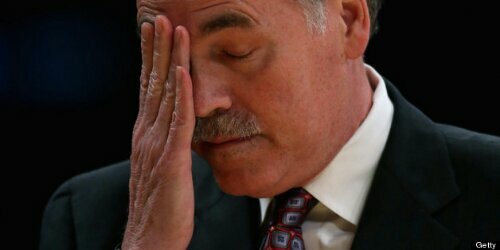 Fire D’antoni. We should have hired Phil. Let me be the first to say I was thoroughly upset when they chose him. Why? Because I knew from past experience watching the Suns that HE DOESN’T COACH DEFENSE. Phoenix’s plan was to run, attack, hit threes and layups and make every opponent pay for every missed shot, every turnover. First of it’s kind. Small ball took every other team by surprise because outside of maybe the Sonics, everybody else was old school balling. Run and gun was not the norm. And no team in those years were equipped to compete without running out of gas. Great players. Nash, Stoudemire, Marion, Barbosa. D’antoni had the right pieces at the right time to pull this of. He had bonafide athletes who can shoot lights out and finish at the rim. With the opposing teams on their heels and not able set defense, they would literally get run out if the building! Defense was not emphasized because offense was clicking and the pace of the game left offenses out of sorts. But D’antoni also had defensive minded players with active hands like Raja Bell who didn’t need defensive coaching. We all knew what beats this team. What their Achilles heel was. What kept him from ever getting a ring. Phil knew even when his team was the lowly eighth seed. Slow it down. Force halfcourt ball. Utilize your big men. Make them play real defense. Lakers almost pulled an upset this way but didn’t have the skillset or discipline to completely pull it of. Poppovich and those Spurs did. Tim Duncan. Paint dweller. Small ball loses. In a seven game series defense wins rings. After a few years the rest of the league caught up. Now they were all running some hybrid of Mike’s system. These teams have true athletes. Thunder, Heat, Nuggets, Warriors. Now you can’t just out score them. You can’t out run then. You also have to stop them. D’antoni never coached defense. That doesn’t mean he didn’t think it necessary. What coach is that foolish? D’antoni never needed to. So that isn’t his strong suit. Fast forward. The current team he has are not great athletes who are dead eye shooters. Furthermore they are not defensive minded. They compete with other teams with the same or better shooting ability and the outcome is the Lakers score about 103 and allow the opponent to score 110. Now he must coach defense. Not energy. Defense. Defensive strategy. X’s and O’s. Problem. But the train wreck of 2013-2014 can’t all be blamed on coach D (pun intended). We have one main reason the jury is still out on firing D’antoni. It’s impossible to say even the great Zen master can guide a team missing this many players for such a long time to any kind of success. No Kobe, no Nash, at times no Gasol. Down to where your bench starts the game. The most starting lineup changes I’ve ever seen. This leaves Lakers with a sloppy roster mashup and chemistry issues that make it hard to evaluate a coaching performance. The elephant in the room is that the Lakers either cannot or do not play defense. The other elephant in the room is the injuries. That loss to the clippers didn’t help D’antoni in any way. I don’t care how injured your team is. The question is simple. Given the desired circumstances of having at least a healthy Kobe and company, keeping the young stars of tomorrow from this team, picking up some quality players in the draft and free agency, is D’antoni the proven guy? I don’t have enough evidence to say yes. Although I can’t blame it on this season. That wouldn’t be fair. This season didn’t give D’antoni a fair opportunity to prove otherwise. But here’s the issue. CAN HE COACH DEFENSE? Furthermore, does Lakers management have the patience to wait and run the D’antoni experiment again? If Mitch decides that defense is the bigger elephant in the room than injuries and that he cannot wait, everybody in LakerNation will get their wish granted. This entry was posted on March 8, 2014 at 5:18 pm and is filed under lakers, nba, sports, Uncategorized. You can follow any responses to this entry through the RSS 2.0 feed. You can leave a response, or trackback from your own site.